An update to the Brown Institutional Master Plan submitted to the Providence City Plan Commission calls for the demolition of 4 historic buildings on the College Hill for the construction of a Performance Arts Center. The Providence Preservation Society opposes the demolition of the buildings. On December 19, 2017, the City Plan Commission (CPC) voted to continue the public hearing of the Brown Institutional Master Plan (IMP) amendment following a presentation by the university architect and comment by 20 community members. Those who spoke eloquently against the demolition of four historical buildings on Brown’s College Hill campus were a who’s who of local preservationists, historians, architects, and developers, and College Hill residents; many of them were Brown alumni, parents, and faculty in addition to two current environmental studies students. At least a dozen more people were there in support of the preservation of these College Hill resources. The IMP amendment has two main components: the new wellness center and residence at 450 Brook Street and the new performing arts center (PAC). The plan for the PAC involves the demolition of four 19th century buildings on Waterman and Angell Streets, including the Lucien Sharpe Carriage House at 135 Angell Street, home to Brown’s renowned Urban Environmental Lab (UEL) for nearly 40 years. 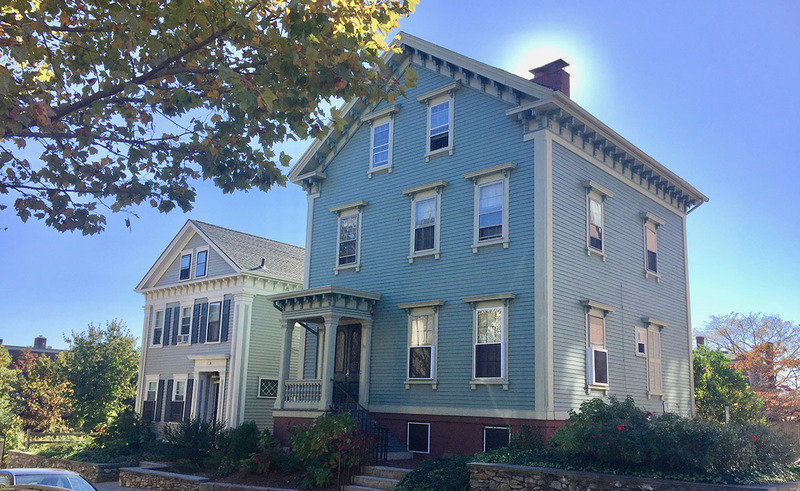 A feasibility study commissioned by Brown determined that one building on the proposed site could be relocated: Norwood House at 82 Waterman Street could be moved to 20 Olive Street, currently a Brown-owned parking lot. The Olive Street location falls within the College Hill local historic district; according to the Historic District Commission (HDC) guidelines, moving a historic structure into a local historic district is “discouraged except as a last alternative to demolition”. PPS opposes the demolition and relocation of these five buildings in the College Hill National Register District. We believe that Brown’s amendment to their IMP is inconsistent with the City’s zoning ordinance and comprehensive plan in regard to the preservation of historic resources and protection of neighborhood character. Those who spoke raised many important points for consideration by the CPC and Brown. They included: College Hill being one of Brown’s best attributes, the isolation of the surrounding historical buildings that would remain, the finality of demolition, and the importance of the Angell and Waterman corridors not just to Brown but to all of College Hill and Providence. After hearing the public comments, the CPC asked Brown to clarify two critical issues: a more satisfactory response to the need for parking for a new 500-seat PAC and greater consideration for alternative building sites, already vacant, such as in the Jewelry District and on I-195 parcels. Brown will have the opportunity to address all of these concerns more fully at the January meeting. The Brown IMP amendment will be continued to the January 16, 2018, CPC agenda. Please continue to submit letters and emails of concern to the commission c/o principal planner Choyon Manjrekar, cmanjrekar@providenceri.gov, and follow PPS on Facebook for updates.